Boys Rule Boys Read! : Beverly Cleary's 100th Birthday! Did somebody out there say, "Who's Beverly Cleary?" Oh, man, have I got something to tell you then! Beverly Cleary has been one of the most popular authors for kids for a long time. Especially for guys. Her books have entertained guys for many, many years. They are still funny and kids still relate to them. After all, even if they were written way back in the day, they still deal with things kids are dealing with today. Adopting a dog. Seeing that dog go amok in the neighborhood. Finding ways to earn money. Bratty kids in the neighborhood. Families trying to find ways to get by. And, speaking of bratty kids in the neighborhood, just wait until you meet Ramona Quimby!! Yep, Ramona the Pest. Ramona the royal pain. Ramona, possibly the funniest kid in any book you'll ever read. Yes, indeed, guys, one of these cool door hangers that says, "Discover new trails...Read!" could be yours! Just send me a review of a Beverly Cleary book or audiobook by--well, since her birthday is tomorrow, I'll give you two weeks to send them in. I'll give a door hanger for any review sent in through Saturday, April 23. Got that? Then start reading and reviewing. 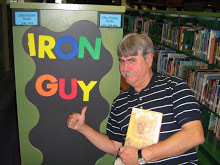 The Iron Guy and lots of other guys out there are waiting to hear from you!! I have original 1950/60s editions of Fifteen, The Luckiest Girl, and several others. They have marvelous Joe and Beth Krush illustrations that haven't made the later editions. Sigh. I think I may have to celebrate tomorrow by reading some! We have testing, so we won't be having a celebration. I loved reading through many of Beverly Cleary's books as a kid. Just today, I picked up Ramona Quimby, Age 8 off of our bookshelf and recommended it to a few students. I think we will celebrate her birthday this week by discussing some of our favorites together. Thanks for the reminder, Iron Guy!